Loki the trickster god is free from his chains. Now he’s readying Naglfar, the Ship of the Dead, armed with a host of giants and zombies, to sail against the Norse gods and begin the final battle of Ragnarok. It’s up to Magnus Chase and his friends to stop Loki’s plans, but to do so they will have to sail across the oceans of Midgard, Jotunheim and Niflheim in a desperate race to reach Naglfar before it’s ready to sail on Midsummer’s Day. Along the way, they will face angry sea gods, hostile giants, and an evil fire-breathing dragon who happens to be a former acquaintance. But Magnus’s biggest challenge will be facing his own inner demons. To defeat Loki, Magnus will need to use words, not force. This will require finding a magical elixir so deadly that it will either make Magnus Chase powerful enough to out-talk the silver-tongued Loki, or destroy Magnus utterly. First off, I have to start with the elephant in the room: Percy. As everyone who has read the second book knows, it is hinted that Percy makes an appearance in this one. And he does, however, the blurb makes it seem as if Percy will be involved in Magnus’s adventures. He isn’t, he appears briefly at the start of the book where he helps Magnus out training in water, we find out that he and Annabeth are going to college in New Rome and that his mum has had her baby (Estelle) and then they leave again, only to be mentioned once more at the end of the book. This is fine, it is Magnus’ story and not Percy’s after all, but I just wanted to mention it because the blurb is rather misleading on this point. We do get a rather hilarious sequence where Magnus’s sword Jack tries to chat up Percy’s sword Riptide (who is apparently a girl) out of Percy’s appearance and some very cute Percabeth moments though, so it’s not totally wasted. There were several typos that I noticed in this book, I wonder if Rick Riordan had less time to edit this one or something, because I don’t usually notice any typos in his books and there were several glaring ones here. The chapter lengths were nice, relatively even about 10 pages per chapter, some a little longer, some shorter, but I still felt like the pacing was off? I don’t know what it was about this book, lots was happening but it seemed to move at a very slow pace compared to the other two. This might just have been me and my assignment addled brain though! I enjoyed that Magnus’ Floor 19 flatmates had a bigger role in this one, we got to find out so much more about Mallory, Halfborn and TJ and that was nice as they’ve played mainly supporting roles up to this point, so it was nice that they all got the chance to shine and play a part a bit more in this book, their backstories and personalities feel a lot more fleshed out after this book which was nice. Alex is still probably my favourite of the characters from this series, she/he (if you haven’t read the second book, Alex is genderfluid and his/her pronouns change frequently throughout the book, Alex never goes by they though, hence me not using it in this review), Alex is fierce, smart, sassy and so confident in who she/he is, I’m actually genuinely in awe of him/her. The rest of the cast of characters is equally cool though, I feel like in this book especially, Magnus really came into his own, he no longer feels like a carbon copy of Percy, he has his own personality and style and that is very evident through this book. Sam is also wonderful, her character arc through this book of finally being able to stand up to Loki was great. Basically everyone on Magnus’s team brings something different and it was great to get to see them all interact in this book. I still loved the humour, the chapter titles in this book were just brilliant and it will always baffle my mind how Rick Riordan manages to make fight scenes both intense and humourous (case in point, this book features a fight scene between ceramic pottery warriors). The pop culture references again bothered me though, I get that Riordan includes them in order to connect with the kids reading, but they felt a little old even for me and I’m a lot older than the target audience of this book! Magnus’ narration reached a new level of sarcastic in this book which I really appreciated because ya know, the more sass the better. The diverse representation in this series is just so amazing. Sam’s Muslim faith is handled very respectfully and I have never before seen a book feature Ramadan before, so it was very interesting to see her faith integrated into the storyline for the book, as obviously quests are very draining, and fasting can present an additional obstacle to that. I obviously can’t attest to how accurate the rep was, not being Muslim myself, but there was nothing that I could see that was glaringly problematic (if you are a Muslim, feel free to correct me). Hearth is deaf and uses ASL to communicate. Alex is obviously gender fluid, & TJ & Blitz are black. Riordan has got so much better at including diversity in his books since the initial Percy Jackson books and it always makes me very happy to see such a wide array of different characters portrayed in a middle grade book. ‘Alex is male right now. I have just been kissed by a dude. How do I feel about that? This entire part just made me squeal, I was slightly worried that Rick Riordan would go down the path of having Magnus only be interested in Alex when Alex was identifying as a girl, so it was great to have this scene confirming that Magnus is interested in Alex no matter what gender Alex is identifying as, it also pretty much confirms that Magnus is pansexual, which yay awesome! I wish that Blitz and Hearth had been confirmed canonically gay though, that was a bit of a disappointment to me as I felt like Rick Riordan had been hinting at it for the past two books and it would have been nice to have the same on page confirmation for them as we had for Magnus’ pansexuality. It just seemed like such heavy hinting for something that never actually came to fruition. I hope that if he does another Magnus Chase series in the future, then this is actually confirmed. The UK finally appeared in a Rick Riordan book! 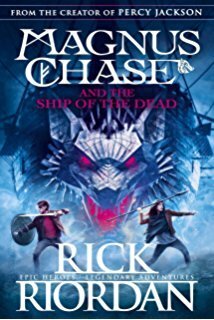 This probably got me happier than it should have, and they’re only there for like two chapters, but I can finally say that a Rick Riordan adventure took place (if only for a little bit) in my home country and that is very cool! There was also a little bit that took place in Norway, a country I’ve never actually seen in a book I’ve read before, so that was pretty awesome. There was a dragon! (That is totally not the most important part of that section, Hearth gets closure with his dad and it’s sad and kind of beautiful, but you know, I’m dragon obsessed so of course that was the bit I got excited about). I feel like I must be the last person on the planet not to know that a group of crows is called a murder? I told my friends this and they were like “Duh you didn’t know that?” so clearly I have been out of the loop on that one. Still I think it’s pretty awesome! I thought the final fight with Loki was a little bit too easy? Like yeah, it’s beautiful that Magnus said all that wonderful stuff about his friends and it was a very moving sequence, but I was expect the final showdown to be slightly more dramatic! It is kind of fitting with his character though, he’s not a fighter, he’s a healer and a team player, so it did make sense that that was how he defeated Loki, it was just different to what I was expecting! Chocolate tug of war sounds absolutely amazing (tug of war over a chocolate lake) and I really want to try it! I felt like the ending was a little anticlimactic? And that it was more there to set up the next Trials of Apollo book than close this one, which I didn’t like, Magnus and co. deserve their own proper ending. It just felt like everything wound down a bit too quickly and the last four chapters or so were just filler. Overall, I did enjoy this book, but it wasn’t quite as action packed as I was expecting. It was great to see the development of the other characters from Floor 19 and see Magnus and Alex finally come to fruition but I was a little disappointed with the resolution of the Loki storyline. Still, it was exactly what I needed at the time, a light, fun filled story, so for that I am grateful and I hope that Riordan returns to these characters at some point, because after three books, it’s safe to say I’ve fallen in love with them! I don’t know what I’ll be reviewing next as I’m reading 3 books at the moment and I don’t know which one I’ll finish first, so I guess it will be a surprise!